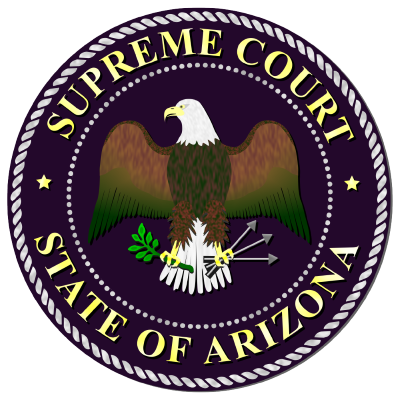 The Arizona Judicial Branch provides professional regulation and licensing for judges, lawyers, confidential intermediaries, court reporters, licensed fiduciaries, legal document preparers, private process servers, and Defensive Driving Schools. The Attorney Admissions Unit implements procedures that are required of law school graduates to become certified to practice law in Arizona. The staff supports two Supreme Court committees -- Committee on Examinations and Committee on Character and Fitness. See the most recent Arizona Bar Examination results online. The Attorney Ethics Advisory Committee was created in accordance with Rule 42.1 and Administrative Order No. 2018-110. The committee may issue opinions on lawyer ethics, professionalism and the unauthorized practice of law. The Attorney Regulation Advisory Committee was created in accordance with Administrative Order No. 2011-44, to assist the Supreme Court and the Chief Justice on issues relating to attorney regulation. The Confidential Intermediary and Sibling Information Exchange Program (CIP) trains and certifies persons to access confidential court adoption records to facilitate the search process between adopted persons or adoptive parents and birth parents (triad members). The Certified Reporter Program certifies court reporters in Arizona who are subject to certification (as defined in the Rules and Arizona law). The Task Force on Lawyer Ethics, Professionalism, and the Unauthorized Practice of Law was created to examine issues related to the Rules of Professional Conduct Committee, Professionalism Committee and the Unauthorized Practice of Law Committee. The Defensive Driving Unit certifies and monitors defensive driving schools and instructors used by the courts to divert traffic offenders from courts, and administers the Defensive Driving Program for the Arizona Court System. The Disciplinary Clerk's Unit maintains all files in formal discipline, disability, and reinstatement proceedings. The unit also trains and supports Hearing Officers and the Disciplinary Commission. Attorneys may also contact the unit to request a Certificate of Good Standing or a disciplinary history. The Fiduciary Licensing Program trains and certifies individuals who serve as court appointed guardians, conservators and personal representatives for a fee. The Legal Document Preparer Program certified legal document preparers in Arizona who prepare or provide legal documents without the supervision of an attorney. The Private Process Server Program develops rules and licensing procedures administered by the Arizona Clerks of Superior Court. The Arizona Commission on Judicial Conduct is the state agency responsible for overseeing the ethical conduct of Arizona judges. The commission also provides staff and other support for the Judicial Ethics Advisory Committee. The committee responds to ethics questions from judges and court staff with informal and formal advisory opinions.